Teso la Monja - is a premium wine made ​​from grapes grown in the vineyard of the same name. 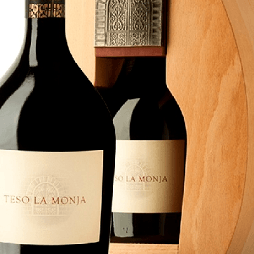 The 2010 Teso La Monja is produced with the Tempranillo grapes from an extremely old, head-pruned, ungrafted vineyard on chalk-rich soils, something quite unusual in Toro where soils are rich in sand and boulders, but not chalky. The grapes were hand-destemmed by a group of 25 people during two days and fermented in open vats followed by malolactic in an egg-shaped, oak vat built by Taransaud, something called OVUM. The wine aged for 24 months in brand new French oak barrels. Putting your nose in the glass is like smelling macerated dark cherries, blackberries, with intoxicating aromas, voluptuous, baroque, still lightly influenced by the wood, showing notes of chocolate, espresso coffee, cloves, cigar ash and black pepper. The palate is full-bodied, with huge fruit, layered and concentrated, with great definition and freshness with flavors of even red fruit. It develops some exotic notes, nutmeg, curry – ever-changing. An XXL Toro dressed in silk. This superb wine should age endlessly. Just don’t look at the price tag. Drink 2015-2025. Teso la Monja is the Toro winery created by the Eguren family from Rioja. The wines are powerful and concentrated, but show balance and no excesses, in a style that is quite different from what they used to produce at Numanthia. The oak is imperceptible despite the long aging and the use of 100% new French oak, a treatment that very few grapes on earth can take. The Teso la Monja project started before they sold Numanthia and what they were looking for were wines that didn’t show any hard tannins, which had acidity. For that they started looking for vineyards that had a longer vegetative cycle, deeper soils with big boulders and usually north-east facing, cooler sites where they get west winds and are specially protected from the south winds. The result is that the vegetative cycle in these vineyards is longer, the ripening is slower and the grapes do not accumulate excessive alcohol/sugar and the tannins are also finer. The big boulders on the surface help to regulate the heat and make the thermal differences less abrupt, resulting in more freshness and acidity. All the grapes are fermented in open vats, mostly foot-trodden, as the aim is not too overextracted, to have a gentle vinification without extracting anything from the seeds. I found the wines, as it happened with their wines from Rioja, balanced and true to their origin, powerful, with superbly integrated oak and soft tannins, without showing the heat from warm, ripe vintages like 2011. I tasted the 2007s and the 2008 from Teso la Monja, the first vintages for each of the wines, and they have not budged an inch. These are powerful wines that require powerful food and should age for years in bottle as they have superb grapes and show very good balance, of course within the style of ripe, powerful and concentrated wines from the region. Marcos Eguren thinks 2011 is quite similar (even better!) to 2010 in Toro. The vineyard is located on a gravel-gravel soils with a high content of calcium and covers an area of ​​1.8 hectares. For the cultivation of grapes are used biodynamic farming methods. All work on the production of wine conducted manually. So the grapes used for the production of "Teso la Monje" pushed himself Egurenom Eduardo, son of Marcos Eguren. Malolactic fermentation was carried out in special wooden containers, having a characteristic egg shape. The wine is aged in new French oak barrels for 24 months. This unique approach puts wine in the category of the great wines of Spain. Wine "Teso la Monja" produced a very limited edition, and he had developed a unique gift package - a wooden box made ​​of beech wood, repeating egg-shaped barrels in which the wine was aged. In 2010, there were only 800 bottles produced.